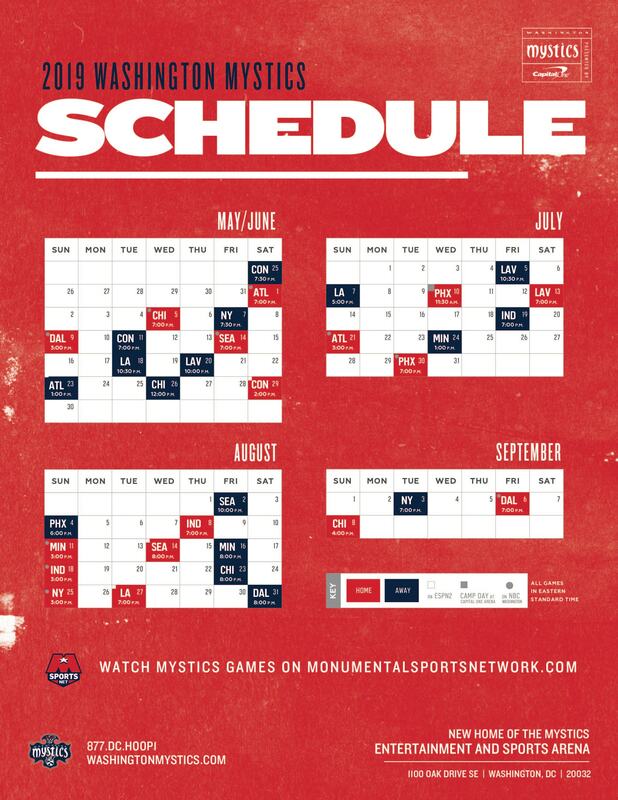 The Washington Mystics Community Ticket Program provides charitable organizations with the opportunity to attend Mystics games through donated tickets. Please read the following information very carefully, then download the Washington Mystics Community Ticket Request Form and fill it out completely and clearly. To participate in this program, your organization must be a non-profit organization. You must include a copy of your 501c3, 170c IRS determination letter, or other government-issued letter/certificate stating your organization's tax exempt status with your request form. Tickets must be distributed solely to beneficiaries of your organization. They may not be sold, exchanged, or used for fundraising purposes. Failure to comply will result in loss of eligibility for future ticket distributions. Request may only be submitted via our online. If selected, each organization/school will be awarded only one block of tickets. Multiple requests from the same organization/school will be combined. ALL children ages 2 and older must have a ticket. All youth must be chaperoned. Organizations must be within the D.C. Metropolitan area and a 75-mile radius of Verizon Center. Organizations must be youth focused or with an emphasis on at least one of the five CR Pillars: Health & Fitness, Education, Military & Veteran, Hunger & Homelessness, Youth Basketball. NO phone calls or emails to check on status of application. Selected groups will be contacted by the Mystics Community Relations Department. At least 50% of the participants in each Community Ticket group must be youth from the organization. Organizations will be chosen randomly each month for the following month's games. (i.e. Drawings for games in June are conducted at the beginning of May.) Groups will usually be notified of their status by mid-month. Organizations that have not yet been drawn will remain in our raffle system to be eligible for further opportunities to be chosen for a game. Only one request form per group is necessary. Game dates are NOT first-come, first-served. If your organization has a special request (i.e. cannot attend a weeknight game for any reason), you may explain this request on the Community Ticket Request form. Don't forget: Your organization's participation in the Community Ticket Program is a privilege, not a right. Please be respectful and mindful of the guidelines. What if I have an individual(s) in my group that needs a wheelchair-accessible seat? Please let us know this information on your request form or upon notification of being selected for a game so that we can try to accommodate you. Can I invite friends/family outside of the organization to come to the game with my group? No. The tickets your group is allocated are to be used SOLELY by your organization. Exceptions may be made on a case-by-case basis. If I bring a few extra group members with me to the game, will they be able to get tickets? No. Your group can only use the number of tickets you were allocated. Extra group members must buy their own tickets. If I do not have full attendance, but close to it, will I still be in the drawings for a playoff game? No. Playoff drawings are used to reward organizations that were able to have full attendance. Organizations with over 100% attendance will not be entered in the playoff drawings, either. There are a few small children in the group. Will they need a ticket, too? Children 2 years of age or older are required to have a ticket. The ticket block in my group is split into two (or more) sections. Can I change seats? No. Receiving free tickets is a privilege and should be treated as such. Tickets have been graciously donated for you to use and should not be taken for granted. Requests for seat changes will not be accommodated. Will parking be provided for my group? What if my group plans to arrive by bus? We highly encourage you to arrive as early as possible to ensure you have a parking space. Bus parking is limited and requires a fee (just like any other vehicle). Bus drivers should be informed of this information. Do I need to send a new request form each month to receive tickets? No. Once you send in your request you are entered into the lottery system. Your information will remain in the system the for the season, though you will be removed from future drawings should you be selected for a game. Please fill out the form below for donation consideration. Once requests are processed and approved, all qualified organizations will be placed on a waiting list and will be notified when tickets are available. Although we will make every effort to fulfill your request, we cannot guarantee that we will be able to accommodate every eligible application. No phone calls or emails please.